The Okatsune Precision Hedge Shears are the best hedge shears you can buy based on the value they provide. Do you like to keep shrubs and hedges neatly trimmed around your home? A neat, uniform look to your shrubs and hedges can be accomplished using a pair of hedge shears. However, which ones should you choose? To help you determine the best hedge shears to meet your needs, we have put together a guide and review of some top hedge shears to help you out. Do you need hedge shears? How do you choose the best hedge shears? There are a lot of different types of trimmers for your garden and landscape, but hedge shears are specifically designed to performing the task of trimming hedges, bushes and some types of trees. 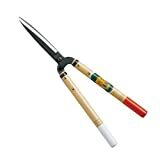 They tend to have long handles and long blades to help you reach areas that are out of reach for typical garden shears or pruning shears. Hedge shears are made to help maintain shape rather than for hard pruning and are only to be used on softer stems and branches. Now that you know the difference between hedge shears and other common garden trimmers, you can make a better decision concerning which tool you need. Essentially, if you need to cut the plant or shrub above the nodes you will need some type of pruning tool. Hedge shears are used to create lines and get rid of stragglers or wild branches, sort of like those wild hairs in your eyebrows. Hedge shears also allow you to create special patterns and topiary. They can also be useful in cutting back perennials in the fall in order to encourage improved spring growth. Once you know the difference between hedge shears and various other garden shears, you have won half of the battle, but there several different types of hedge shears as well. Among the different types are fixed, adjustable, angled and telescoping handles. Straight Blade Shears. Provides sharp, clean cuts of smaller shoots and soft woods. These are easier to sharpen. Wavy Blade Shears. These are smooth blade shears with a wavy shape which helps to grip the material and prevent it from sliding along the blade during the cut. They are more difficult to sharpen. Serrated Blade Shears. Serrated blades provide a similar function to wavy blades and are better suited when it comes to cutting harder wood and irregular hedges. These cannot be sharpened. Let’s take a closer look at various attributes of hedge shears and how to make your choice between one type and another. Selecting the right hedge shears will depend upon how you are going to use them as well as personal preferences and budget expectations. Length becomes important when selecting hedge shears because some parts of your hedge or shrub might be difficult to reach due to your own stature or the size of your hedge. Hedges come with longer handles or longer blades. In general, they range from 20” to 30” in overall length and some include telescoping handles or adjustable handles to extend or shorten this length. Keep in mind that though longer handles will help with reach, they will be a bit more awkward to use. Grips are an important feature for both comfort and control. To begin with, consider hedge shears with a non-slip grip to prevent them from slipping out of your hands while you are using them. Ergonomics or the feel of the handles in your hands also become important, especially when you have to use them for an extended period of time. The design and construction of the blades are additional features to keep a very close eye on. We briefly discussed the three different blade types in the section about different types of shears. Besides looking at straight, wavy or serrated blade edges, there are various lengths to consider as well as the composition of the steel. Blade length. Those who do a lot of close trimming opt for shorter, 6-inch blades and those who have a larger hedge to trim or need a little extra help to reach tend to look for 9 to 12-inch blades. Composition. The composition of the blades is important when it comes to both durability and maintaining an edge. Higher quality steel is not only stronger but stays sharp longer. Besides these other considerations, some blade designs include a non-stick or stainless steel coating to prevent the blades from gumming up or rusting over time. The handles on hedge shears might be made of various types of materials like wood, aluminum, fiberglass or steel. Because of the leverage required for operating the blades of the shears, the handles need to be strong, but heavy materials add additional weight. Adjustable or telescoping handles can be helpful for extending your reach when you need to but avoid making the shears too awkward to use. Accidents tend to happen when fatigue sets in. Because hedge trimming is a repetitive task and much of it is done reaching above the height of your shoulders, the weight of your hedge shears becomes an extremely important feature to consider. Weight is determined by the composition and size of the handles and the blades. This is another balancing act you will have to keep in mind as you shop. Ease of use is related to several different factors. To begin with, most shears will not cut branches larger than ½” in diameter. Some might come with a special notch or an adjustment for cutting larger branches, but your expectations of what the shears will cut need to be realistic. The action of the shears on opening is an important factor. Some open very easily and function similar to a pair of sewing scissors, but others can be sticky and harder to open. Also consider shock proof bumpers, which help to soften the jarring and vibration associated with forcing the handles together over and over again while you cut. The pivot assembly on your shears is a very important feature that cannot be overlooked. The pivot assembly not only allows the shears to function more easily but can also be used to adjust the tension of the blade. Geared technology within the pivot assembly can also add to the ability of the shears to cut larger branches or to help provide additional leverage so that the shears cut more smoothly with less required effort. Keep in mind that this is a potential weak point where the shears can break down or require a great deal of maintenance, so you want to be sure that the pivot assembly is of high quality and that it can be easily lubricated and maintained. Considerations of price always figure into any purchase for obvious reasons, but the old adage, “you get what you pay for,” stands true when it comes to hedge shears as it does to all purchases. A high-quality pair of hedge shears use materials that cost more and will come with a higher price tag, but they will also tend to come with a long-term warranty as well. Keeping all of these features in mind as you shop for the right hedge shears will help you to make a well-informed decision when it comes to making a purchase. Using hedge shears is not particularly dangerous in most cases, but when they are used improperly or made to do tasks for which they were not designed, they can become a hazard. Safety glasses. Always wear safety glasses when using hedge shears. It is very common for a few branches to fly up into your face while trimming your hedge and protecting your eyes from this debris is a must. Long pants, long-sleeved shirts and closed toed shoes should also be worn to prevent being scratched and stung by flying objects (not to mention the possibility that you might stir up a stinging or biting insect in the process). Gloves. Gloves are important for providing protection for your hands, but can also help with keeping a good grip on the tool while you’re working. Balance. Keep your feet in a position where both of them are firmly planted to the ground or a solid surface. Most accidents with hedge shears occur when a person is out of balance on a stool, an unstable ladder, or when extending beyond your reach to get one more little bit before moving the ladder to a new position. Keeping these few precautions in mind can make a difference when it comes to preventing accidents, injuries or discomfort. The primary purpose of hedge shears is for cutting through softer branches rather than harder, woody stems. Even though they might cut the occasional thick, woody branch, they are not really designed for that task and using them in this way will limit their longevity and efficiency. Maintaining a Formal Hedge. A formal hedge is one that is “formed” into a geometric shape or a stylized topiary. In this function, they are used to maintain the lines you have established by trimming away new growth. Hedge shears are inappropriate for pruning many shrubs and cutting them in the manner that you do when trimming a hedge will kill them. Cutting Back Perennial Plants. Depending on the type of plant, you will want to cut them back to their crowns in fall or early spring. Hedge shears can be used for this task because the cuts can be made imprecisely and the main goal is to cut away bunches of soft, dead stem tissue quickly. They do not work well for thinning cane plants like raspberries and also should not be used for semi-woody perennials. Annual Taming or Deadheading. There are some soft and extremely prolific plants, such as clematis and vines which grow extremely fast and need to be kept under control on an annual basis. Shears can be used on these plants because they are non-woody and because they grow so prolifically that they cover up unnatural cuts. Hedge shears should be used in quick cuts of small bunches of green or soft growth, much like you would use scissors to trim your beard or those unruly eyebrow hairs. The better your hedge shears are maintained, the easier and safer they will be when it comes to using them. Cleaning. Keep the blades and pivot assembly clean. Debris stuck in the pivot will cause them to wear a great deal more quickly and stains on the blade tend to contribute to corrosion. Sharpening. Keeping a sharp edge on your hedge shears makes them easier to use and allows you to make cleaner cuts for maintaining precise lines. Tightening. With use, nuts and bolts tend to work loose. On a pair of shears, a loose nut or bolt can make them extremely difficult to manage as well as leading to very poor cutting quality. Check the tightness of the pivot assembly before each use to make certain that all is in order to save on future maintenance issues and keep them cutting properly. Lubrication. Friction points are what make hedge shears and other tools harder to use. By keeping the pivot point of your shears well lubricated you can keep them operating with ease. Machine oil is the best lubricant to help provide smoother action as well as help to prevent corrosion and wear. By properly maintaining your hedge shears you can make it easier to use them as well as extend the life of the tool so that you won’t be buying replacements as often, which will save you money in the long run. With all of the features, benefits, and tips for use we have discussed, you should have enough information to know what to look for in a pair of hedge shears. Keeping these criteria in mind, you can use the reviews below to compare how various models implement these features into their designs. Smooth cuts are definitely a feature of these Okatsune Precision Hedge Shears. Featured in the construction of these shears are Japanese sword steel, a hardened locking bolt pivot, and Japanese White Oak handles with a scored hand grip. The most notable feature of these shears are the hot hammer-forged Japanese steel, which is hardened to 60 on the Rockwell scale, and are composed of Izumo Yasuki Steel. These features allow these 7 5/8” blades to maintain their edge as well as make them easy to sharpen to a finer edge. Simplicity and strength are in the pivot assembly of these shears, which utilize a hardened bolt and nut for easy tension adjustment with a wrench. Japanese White Oak handles finish out these lightweight shears. Though they are made of a lightweight material, they are still strong and durable. One drawback of these handles is that they don’t have a soft, non-slip grip. These shears weigh 1 lb and 12 oz. and are 22 inches long, making them a great size for easy handling, though they might be a bit short for those who need assistance in reaching. You will also pay a little bit more than the average price for these shears, but you are getting a great deal of quality and value in your purchase, but their warranty is only for 1 year. STRONG ALUMINUM HANDLES. The strong steel handles will deliver dependable cutting power every time you need to tackle a hedge trimming job. Every cut will be a joyful experience and your shrubs will grow back nicely: don't hack away at your beautiful bushes with powered hedge trimmers! The precision cuts of this tool will preserve your plant's health for long lasting results. Tabor Tools provides the B640 Hedge Shears for your consideration. These shears are designed with a wavy blade and aluminum handles with grips that will stay in your hands without slipping. 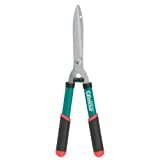 The wavy blade design of these shears is 8 inches long and works well for holding and clipping branches that might otherwise dodge out of the way. They are made of forged carbon steel and can be sharpened by someone with the right level of skill. Aluminum is used in the construction of the handles, reducing the overall weight of the shears. They include shock-absorbing bumpers to reduce vibration and impact which can lead to fatigue while you are working. These handles are equipped with hard plastic, formed grips to keep your hands from slipping as well. Keeping the pivot assembly properly adjusted is easily accomplished with the hand-tightening nut, which is large enough to get a good grip and provide good leverage. A drawback to this is that keeping it tight will be based on the strength of your hand rather than that of a wrench or other tool. Overall, these shears measure 24 inches, which make them a good length for reaching those branches that are a little bit further away, though it makes them a bit bulkier when it comes to precise close-up work. These shears are easy to use and cut with solid precision. They come at a price that will fit most budgets and is backed by a 1-year warranty. Though billed as no-frills shears, these Gilmour Basic Hedge Shears come with plenty of features for serious consideration. This tool features a non-stick coated blade, oval-shaped tubular steel handles and a comfort molded grip for easier handling. The 8” blades on these shears are made of tempered steel and are coated with a non-stick film to provide for reduced corrosion. The bottom blade is serrated to help hold branches in place and also include a notch for cutting larger branches. A drawback to the blades on these shears is that they do not hold an edge and you won’t be able to keep them sharp once they’ve become dull. Durability is built into the handles of these shears utilizing steel construction. Shock-absorbing bumpers are used to help reduce vibration and reduce fatigue. They are equipped with molded plastic grips for greater comfort and precise handling. Slip-on handles have a propensity for slipping off of the ends of the handles over time. The tension of these shears can be easily adjusted with a wrench on its locking nut, which makes things simpler when it comes to maintenance. However, the pivot assembly does have a tendency to work loose easier than some models. Twenty one inches is the overall length of these shears making them a little less bulky, but because of their steel handle construction makes them a bit heavier. Basic is a good word for these shears which come at a budget price, but also include a limited lifetime guarantee. These Fiskars 23 Inch PowerGear Hedge Shears received an award from the Arthritis Foundation Ease-of-Use Commendation. Specially designed blades, a patented PowerGrear pivot mechanism and DuraFrame handles with SoftGrip grips all combine to make these shears a great choice. The hardened stainless steel blades on these shears are ground to razor sharp precision and stay sharp. They include a rust-resistant, low-friction coating to make for easier use. The blades on these shears are 9 inches long, which makes them a little bit bulkier than some. Patented DuraFrame handles are used in the construction of these shears, which are lightweight but durable as steel. Also featured are rubberized shock-absorbing bumpers to prevent shock and vibration. They also include SoftGrip grips to make them softer for those with gripping problems. However, the roundness of the handles and grips are a little less than ergonomic. Fiskars’ PowerGear pivot mechanism is what has it winning awards. This gearing mechanism provides greater leverage and requires three times less effort to use these shears. A drawback to this type of mechanism is that it cannot be tightened if/when it becomes loose. At 23 inches, these shears are about average for most hedge trimming jobs. Their construction materials and average size keep them light enough to be easy to use. The price of these shears can also be handled by those on a budget and they are backed by a lifetime warranty as well. 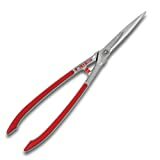 If you would prefer using a smooth pair of sewing scissors with extended handles, then these ARS HS-KR1000 Professional Hedge Shears would be a good choice. Included in these shears are hardened carbon steel, replaceable blades, a locking pivot bolt mechanism, and cast aluminum handles with rubber cushioning. The 7 inch, high carbon steel blades in these shears are marquench hardened (a process that minimizes distortion and eliminates cracking), and chrome plated to prevent corrosion and maintain sharpness. These blades can be replaced or removed for sharpening and then put back in place, making it easier to always have sharp blades in your hedge shears. 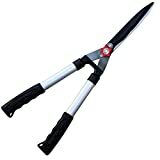 These shears only weight 1.7 pounds thanks to their cast aluminum handles with rubber cushioning running in the channels the entire length of the handle. This feature allows you to “choke up” on the handles for greater control, but still, have a non-slip gripping surface. A locking pivot bolt system is in place to help maintain tension on these shears and to allow you to remove and replace the blades. This adjustment can be easily accomplished with a wrench. This point along with the attachment of the blades to the handles are potential weak points on these shears to keep in mind. Overall, these shears are 25 inches long, making them a decent length for reaching, but they might be a little bit bulky for some users when it comes to close, precision work. You will pay extra for these shears, which are made of higher quality materials and have a more innovative design and are backed by a lifetime warranty. Hedge shears are designed to complete a specific task. Used properly, they are able to help you to keep your shrubs and hedges looking clean and crisp. Given the various features to look for in a pair of hedge shears the best hedge shears included in our review are the Okatsune Precision Hedge Shears. Their blades are made of the highest quality Japanese sword steel allowing them to keep a sharper edge. The Japanese White Oak handles on these shears keep them lighter in weight, but they are still strong and durable. The length and weight of these shears is very well balanced and less bulky for easier use with less fatigue. Simplicity in the pivot mechanism makes these shears easy to adjust and maintain.